It must be rather challenging to create a trailer for a digital card game. 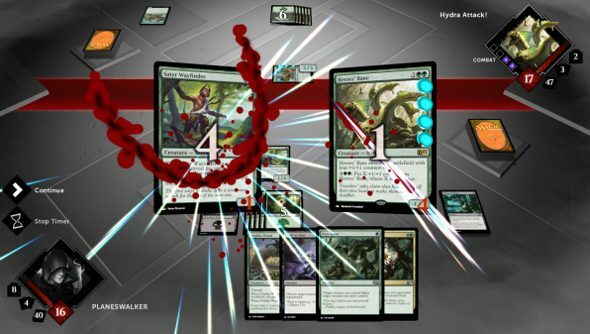 Wizards of the Coast have had a go, anyway, putting together a video for Magic 2015. Wizards decided to go down the heavy metal route, and that’s probably not a bad idea given the genre’s magical proclivities. Magic 2015’s chucking in a bunch of new features like a custom decks, new booster packs with premium DLC and a new deck builder that Wizards is touting as “robust”. Our Jules took a look at it a month ago and reckons it’s the best in the series and a middle ground between Hearthstone and Hex.